Three thoughts on the Utah Jazz’s 110-100 loss to the Memphis Grizzlies from Salt Lake Tribune Jazz beat writer Andy Larsen. The Jazz had a 120 defensive rating against the Memphis Grizzlies. The Jazz are supposed to be a good defensive team, and Grizzlies are not supposed to be a good enough offensive team for this to happen. Yet, it did. How? The really tempting answer is the fouls that the Jazz gave up, sending the Grizzlies to the line 34 times. The fouls really were the defining characteristic of a slow, ugly game that was just a bore to watch, but the Grizzlies let the Jazz off the hook: they only made 61.8 percent of those free throws. That means that the other possessions were also converted at a rate of nearly 120 points per 100 possessions. Basically, the Jazz just weren’t tough enough defensively even when the whistles weren’t blowing. There are so many examples. I’ll start with Rudy Gobert, the reigning Defensive Player of the Year. Gobert is an excellent defensive player, there’s no doubt, and he can’t block them all. But on plays like this, he should be able to swallow Jaren Jackson Jr. whole by raising his hands throughout the possession and making the initial shot difficult. Instead, he just backpedals until it’s too late. While Gobert didn’t bring his usual level of impact, neither did anyone else. Derrick Favors still looks a step slow — he must still be dealing with the effects of knee soreness, because players don’t usually lose a step at 27. Joe Ingles let Garrett Temple just drive by him, Georges Niang let Omri Casspi just drive right by him, and Grayson Allen let Mike Conley just drive by him. Oh, and the Jazz got backdoored to death, too. Here’s Gobert getting backdoored by Garrett Temple. Here’s Allen losing focus and letting Brooks score an easy layup. There are more examples. To have a chance, the Jazz can’t have this many individual breakdowns on the perimeter, nor inside. It was just too easy for the Grizzlies to get easy drives to the rim tonight. But ideally, the defense would be able to handle some of those situations through rotations, being able to count on each others' help. That wasn’t always coming on time tonight. This is a Conley isolation situation on Favors, so the Jazz should be ready to help, because Favors probably won’t be able to keep up with Conley’s speed. Gobert is guarding Jaren Jackson Jr. in the corner. Jackson isn’t a huge 3-point threat, and he came into the game shooting 15.4 percent from deep. You’re probably okay if Conley passes him the ball. But instead, Gobert never really helps, even as Conley shoots on his side of the basket. When this ball is turned over, the Jazz are in a little bit of trouble: Gobert, Ingles, and Favors are all in the paint. But Allen and Rubio do a good job of getting back in transition and forcing the play to come to a halt... except that Dillon Brooks beat all three other Jazzmen down the court despite starting from the same spot. And finally, there were just a ton of instances of missed communication. Niang and Rubio here just don’t decide if they’re switching or not, and so no one guards the ball. The communication aspect is the one that the team talks about most after losses like this, and that’s fair: the communication does need to improve. But it also feels a little bit like they use “communication" as a catchall, because it’s kind of a nebulous concept that’s difficult to verify unless you’re on the floor and understand the Jazz’s defensive vocabulary. In blaming everyone, no one gets publicly criticized. That’s probably a good media strategy. But it’s not just communication. Everyone on the team needed to be smarter about when they fouled tonight. Every perimeter player needed to keep significantly better containment. 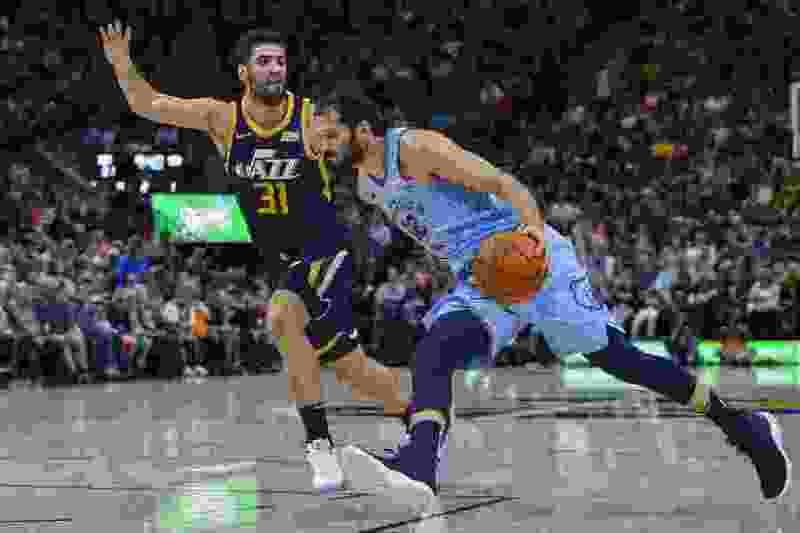 Favors and Gobert needed to guard their assignments inside better, and when they had the opportunity, needed to slide over to prevent easy two points. They needed to make Memphis feel them defensively in any sort of an impactful way. Instead, they got beaten repeatedly individually and collectively, resulting in either easy layups or late hackery. It’s not good enough. Okay, so now that I’ve specifically criticized this Jazz team to the degree that they deserve, I’ll say this: I’m not that worried about how this will play out in the long term. Over the aggregate, this Jazz defense is still above-average defensively (14th in the NBA) and I have pretty significant faith in Snyder, Gobert, and the whole Jazz to improve markedly over what we’ve seen so far. There’s too much of a track record of defensive success with this Jazz team under Snyder for it to fall off over the course of the season, especially given the continuity in personnel from season to season. We know they can be great. Furthermore, we’ve seen lapses like this multiple times over the last couple of seasons, especially early in the year, and the Jazz have always rebounded and coalesced as the season moves along. Nor am I worried about the Jazz’s 0-3 home start. With two matchups against a tough Grizzlies team and what was a very impressive performance in a loss against the defending champion Golden State Warriors, I think the Jazz’s home struggles reflect schedule and normal ups-and-downs, not some home curse. The Jazz have a positive net rating and still project to have a very good record at the end of the season, even after tonight’s game. FiveThirtyEight projects the Jazz to win 54 games, good for second place in the Western Conference. In their ELO-based system, they’re still the fourth-best team in the league. And yes, that system heavily takes into account last year’s performance. But for this Jazz team as much as any, that makes sense: it’s very nearly the same roster as last year, and Jonas Jerebko is not the missing ingredient here. The record may get worse before it gets better: Denver on a back-to-back is a challenge, and Toronto and Boston at home are two very good teams that will require the Jazz to be near their best. But the schedule balances out, of course, and so long as they stay together, they should make it up with wins in the second half of the season.